Distributed solar energy has great value! Solar energy from photovoltaic systems is climate friendly, has few or no moving parts, works best on hot sunny days, and never varies in price over the life of the system. Too often, these and other values are overlooked in traditional regulatory proceedings and by too many electric utilities. Getting the Value of Solar right is vital to energy policy in New England and across the United States. Since the first Value of Solar study was completed in 2006, the concept has exploded on the US scene. 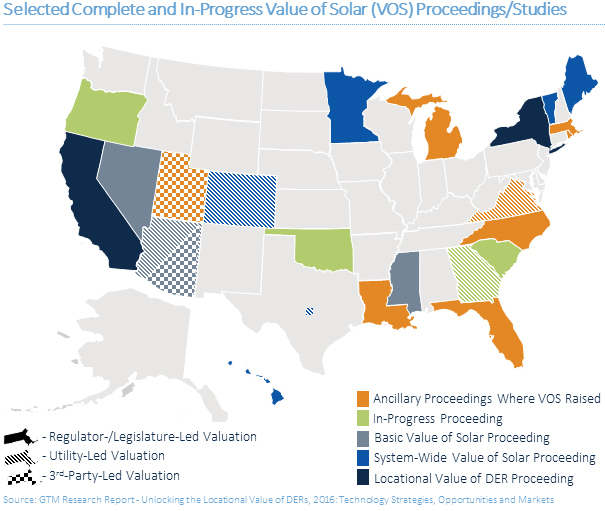 Value of solar studies have a role in improving utility resource planning, informing solar incentive programs, establishing an analytical foundation for net metering rates, and as a foundation for new rate designs such as the Value of Solar Tariff. Pace Energy and Climate Center created this Value of Solar Center of Excellence website with support from the John Merck Fund to bring all the learning and tools about Value of Solar to one convenient and up-to-date location. This website, which we call "VOSCOE," organizes that knowledge. VOSCOE includes a comprehensive reference database of documents related to the value of solar. Our database catalogues solar valuation studies, valuation methodologies, legislation, regulations, public utility commission documents, presentations, substantive media articles, and other reports and analyses related to the value of solar. For those interested in a brief introduction to the concepts please see this brief article and short presentation. Looking at the trends in the national net metering debate. An overview of Virginia's Wind and Solar Policy.